We have been so fortunate that during our tough times since becoming parents (two pregnancy bedrests, hospital stays for me before all our boys were born and for them many weeks after, and the challenges of being parents to newborn triplets) to be the recipients of much support, meals, volunteers, and gifts for us and our little ones. We are now going through a tough time as my husband was recently laid off from his job of 15 years. I am constantly amazed by our family’s, friends’ and community members’ generosity and thoughtfulness. I do not know what we would have done and do now without their help and support. I am not the best at keeping up with it, but have tried over the years to always be thankful to those who have helped us. Before my triplets were born I was determined to catch up on the thank you notes from my older son’s birth. This year I finally caught up on all the notes from when my triplets were born to the present. I am now doing a much better job at keeping up. People may think I am crazy to send a thank you note so late, but I feel it is important. I do not want anyone to ever think I take their help or gift for granted or don’t appreciate it. After my older son was born, I created a form to keep track of all the thank you notes I had to write. Here it is if you want to use it for yourself! 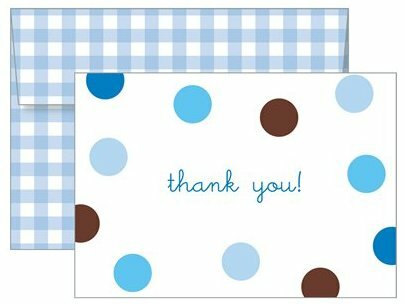 As I was working on some cards yesterday, I thought about how gratitude is really such a cheap thing to give. I thought I would highlight some very inexpensive ways to show your thankfulness to others — the most important being a good old-fashioned handwritten thank you note! ∞ Target – They sell a large box of 50 cards for $10.99 that end up being about $.22/card. Their 24-count Green Room cards for $5.99 come out to $.25/card. This past weekend I also found Mary Engelbreit notecards in the dollar section. They had 8 cards for $1 each. That is only $.13/card! ∞ Michaels – In front of the registers, they sell packs of 8 cards for $1 each. That is also only $.13/card. ∞ Free card offers – There are many online card stores popping up now. They allow you to choose your design, personalize the message and various features, and even add photographs. Check out Kosher on a Budget for the latest deals. Some of my favorite card sites include Cardstore.com and Ink Garden. ∞ Donate to nonprofits – We are on the mailing lists of various non-profits that we have given to over the years. Some send address labels, notepads, or notecards as a gift to encourage you to donate to their charity. ∞ Photo collage card – My friend Lori came up with this idea. She uses Google Picasa photo software (a free photo storage software) to make a collage for a particular occasion. She personalizes each 4 x 6 collage to have photos from that occasion that feature or relate to the person she is thanking. She then adds a message right on the card/photo. You then save your new collage and upload it to whatever photo printing website you use. The cost is whatever that site charges per print. These become a one-of-a-kind thank you card. All you need is an envelope and a stamp! ∞ Photo cards – For my triplets’ birthday thank you notes, I made a photo card on a photo sharing website (like the kind people send out for holidays). Many of them offer various themes, colors, number of photos, etc., so you can send them any time of year for any occasion. I took advantage of a free 10 cards offer one site had and only had to pay shipping! The price on these cards will vary based on the size and whether you are choosing photo paper or cardstock. The photo cards normally are cheaper. Some of these may seem trite, but think about how it would bring a smile to your own day to receive one of these! ∞ Recommend a friend’s business to others. ∞ Patronize a friend’s business by either buying a product from them or using their service. ∞ Post a comment to Facebook and recognize someone in it. ∞ Make a comment on someone’s Facebook post to show appreciation for something they have shared. ∞ Make a comment on someone’s blog or website to give a compliment or response. ∞ Send an email to an organization, school, shul/church, or business expressing thanks for a particular program they sponsored, speaker they brought in, or product they offer. All too often we forget to tell people/groups when we like things they have done. Compliments and comments are so much better than just complaints! ∞ Remember your doctors, hairdressers, repairmen, postal workers, service providers, etc. when you are sending out holiday cards. ∞ Make extra food and give it to a family member, friend, or neighbor. ∞ Add someone to your shaloch manos list who may not otherwise get one. ∞ Call the supervisor of an employee who gives you good service. ∞ Leave a note in a colleague’s mailbox at work (and maybe include a small treat). Challenge yourself to express gratitude to someone each day!